As you are learning French, differnet aspects of France ' La Culture Francaise ' every one is fascinated by French Wine and Cheese. La Fromagerie brings you an opportunity to taste the delicious and authentic French Cheese, and some cheese based dishes through its Cheese Club. Cheese Club launched in October 2008 in association with Alliance Francaise. The aim of this Club is to introduce the best veriety of cheese to the Bangaloreans. 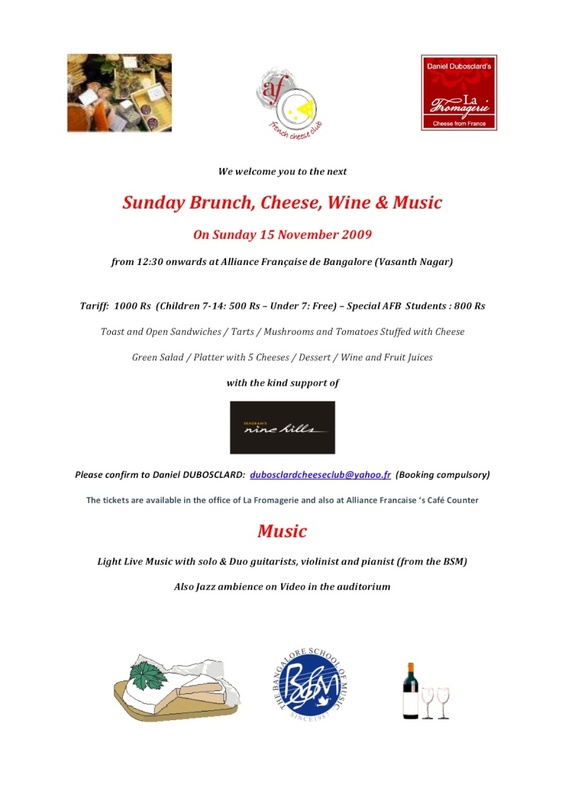 The next event of this cheese club is on 15th November (Sunday Brunch) at Alliance Francaise. We have a great discount offer for the students of Alliance Francaise for this Cheese Club Event. Light Live Music with solo & Duo guitarists, violinist and pianist from the BSM has been organised for the event. So join the Cheese Club Immediately. Dégustation de 5 fromages/ tartes/ salades/ desserts/ vins pour Rs 800 (étudiants AFB sur présentation de la carte) au lieu de Rs 1000. Les billets sont en vente au café de la Liberté.